King airless sprayer ... rugged, dependable and durable. 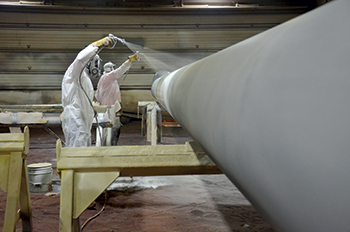 To ensure the durability of a coating and prevent corrosion, optimal preparation of the surface is vital, says STEPHAN RINDFLEISCH* of Graco, which offers a range of solutions to prepare and then coat concrete to provide it with long-term protection. In the case of concrete, the concrete surface profile (CSP) is used to describe the concrete’s outer surface texture. • Replica tape is a low-cost tape with a layer of crushable foam that is temporarily adhered to a material’s surface. When the tape is compressed onto the surface, a mirror image of the peaks and valleys on the concrete’s surface is formed on the tape. • Replica putty works similarly, except that the media consists of two putty compounds that are mixed together and then applied to the concrete surface. After the putty has cured and hardened, it can be visually compared with the International Concrete Repair Institute’s (ICRI) Concrete Surface Profile Coupons according to ASTM D 7682 - 10, Method A, or measured with a micrometer per ASTM D 7682 Test Method B. • In laser profilometry or laser striping, a laser beam is projected onto the surface. The instrument calculates the distance from the laser beam source to the surface based upon the time it takes for the laser beam to travel to the surface and be reflected back to a receiver in the instrument. Many measurements are taken to produce a “map” of the surface roughness. • The sand spread test involves spreading a known volume of sand on the surface and then measuring the area covered by the sand. This test provides the average depth of the concrete’s macrotexture. • Although subjective, one of the best and most practical ways to assess CSPs is to use rubber comparator chips. They range from CSP 1 (smoothest) to CSP 10 (roughest), allowing one to make a visual and tactile comparison with the surface in question. • The pull-off adhesion test measures whether the bond holds. It involves bonding a disc to the concrete test surface and then measuring the force required to pull off the disc. If the coating is removed before the concrete fails, then the bond between the coating and the concrete is weak, indicating that the surface profile may not have been optimal. Graco’s King airless sprayer ... suited for all kinds of protective coatings and corrosion control applications. 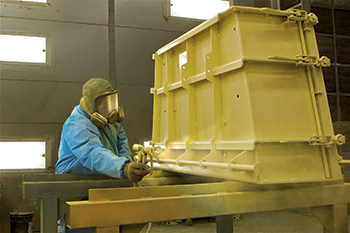 Graco’s solution for optimal surface preparation is wet or vapour abrasive blasting. This technique involves adding water simultaneously with the abrasive media in a pressure pot. The abrasive becomes suspended in water, and the mixture is then projected at high velocity by a forceful flow of compressed air. By encapsulating each blast particle with water, extra weight is added to the media which enlarges the impact of the blast media on the substrate. In addition, the removal and feathering of the surface goes smoother and less media is used. The water reduces splash back and traps the dust being produced. Abrasive blasters come in all shapes and sizes. It’s essential to choose one that will reduce project costs and increase the speed, efficiency and productivity of blasting. Graco’s EcoQuip 2 vapour abrasive blaster fits the bill perfectly. It is well proven in different industries for a range of applications including concrete surface treatment. It provides a performance equivalent to dry abrasive blasting but with 92 per cent less dust, thus minimising the need for personal protective equipment (PPE), tenting and containment, and decreasing the environmental impact. EcoQuip 2 uses up to 75 per cent less blast media and far less water than traditional wet blasting, and creates little run-off, thus there is no large slurry mess to clean up and dispose of. The bottom line is that EcoQuip 2 reduces project costs while increasing the speed, efficiency and productivity of blasting. It also comes in a lightweight model which is easier to take from one surface preparation job to another. EcoQuip 2 Portable (EQp) still packs the necessary power for any small- to medium-sized job. It can blast up to 10.5 bar and can handle most of what a 10.5-cu-m-per-minute compressor delivers. It’s optimised to work well with a 5.2-cu-m-per-minute compressor and blasts for up to 90 minutes between refills. It weighs only 99.8 kg and is easily transported on a cart with lift handles. As wet cleaning methods have increased, so has the prevalence of flash rust on steel surfaces. This is rusting that occurs on metal within minutes to a few hours after the cleaning or surface preparation is complete. The speed with which flash rusting occurs may be indicative of salt contamination on the surface, high humidity or both. Flash rust variations include rust-back and re-rust. Rust-back occurs when there are already contaminants on the surface of a substrate. For example, if bare steel is exposed to high humidity or moisture in the air, rust-back will occur. This is typically something seen after dry abrasive blasting, or using power tools such as needle guns, to clean the surface. Re-rust, or rust bloom, refers to new rust and occurs evenly over a large section of the surface. It’s similar to flash rust, but rust bloom can take days to develop. • Minimise water use. The less water the wet abrasive blaster uses, the less rust inhibitor is needed, saving money. EcoQuip 2 operates effectively using less than one litre of water per minute. Graco’s new motor allows the use of multiple guns. Once the surface has been optimally prepared following the suggestions above, it’s now time to spray a protective coating. Graco’s King airless sprayer product line has been in use for over 60 years. In that time, it’s been the preferred brand for many companies in a range of industries. 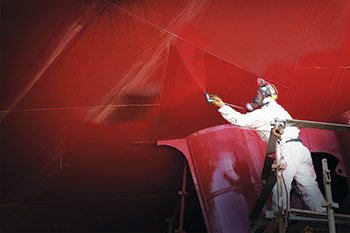 This rugged airless sprayer has been appreciated for its dependability and durability to handle the toughest protective coatings and corrosion control applications. It’s recently been revamped. • More reliable poppets: Graco has completely redesigned the poppets on the new King sprayer so that they are of a higher quality, much more reliable and provide better sealing. The passages are also much larger, making them easier to service, troubleshoot and replace. • Less pulsation means a better finish: Compared to NXT motors, a 145 per cent higher intake/exhaust capacity in the air valve leads to a faster, smoother changeover, eliminating minor blemishes in the finish. • Improved sealing and strength: Packings play a critical role in optimising spray performance by sealing pressure and holding material inside the pump. The tighter the seal, the better the performance. This is ensured with King sprayers because they incorporate seven throat packings instead of five. • Seventy per cent less chance of icing: The poppet valves (on the XL3400 and XL6500 models) are insulated from motor castings that can often drop below freezing temperatures. The newly designed poppets and external pilot lines virtually eliminate pilot valve freezing that can result in an instant stop. • Multi-gun capabilities: Graco’s powerful new air motor allows the use of multiple guns with almost no perceivable pulsation. A new manifold has been designed to simplify the installation of multiple guns. • Trusted, robust pump: An option for the King sprayers are the MaxLife Pump Lowers, which are designed for robustness and reliability in the most demanding jobs. This model lasts up to six times longer than its predecessor. The King is available with an XL3400, XL6500 and XL10000 motor. Output per cycle varies between 180 cc and 430 cc; and output at 60 cycles per minute varies between 11 and 25.5 litres per minute. The maximum working pressure is 500 bar. * Stephan Rindfleisch, AFTD product marketing manager of Graco. Founded in 1926, Graco has grown to become a world leader in fluid handling systems and components. The company went public in 1969 after changing its name from Gray Company to Graco.